Pearl barley, wheat berries, millet and wild rice combine in the ancient grain pilaf that forms the base of this bowl. 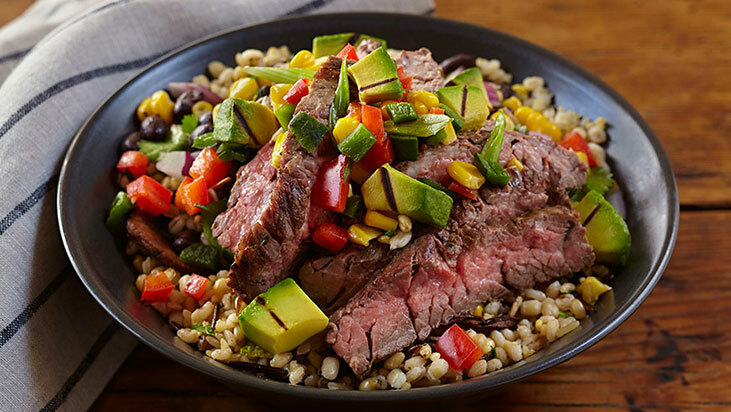 Chef Stark layers on Southwestern flavors with ingredients including grilled avocado-corn relish, roasted poblanos and chimichurri-sauced skirt steak. Marinate skirt steak in chimichurri sauce at least 1 hour or overnight. Meanwhile, prepare ancient grain pilaf: Preheat oven to 350 F. In large overnproof pot with tightfitting lid, melt butter over low heat. Add oil, garlic and onion; cook until onions are softened and translucent, 5 to 10 minutes. Increase heat to medium-high and add mushrooms; cook about 5 minutes until soft. Add barley, wheat berries, wild rice and millet; stir well to coat with oil. Cook, stirring often, 10 to 15 minutes. Stir in stock and bring to a boil. Cover pot and place in oven. Bake 30 minutes. Remove lid and cook a little longer to soften grains, if needed. Fold in chopped herbs. Drizzle with olive oil and season with salt and pepper; keep warm. Prepare grilled avocado-corn relish: Heat 1/4 cup olive oil in large skillet over medium heat. Add corn, salt and pepper; saute until corn is heated through and tender, about 5 minutes. Transfer to large mixing bowl and set aside to cool. Preheat grill. Brush avocado slices with oil; grill 30 seconds on each side on hot grill. Dice avocados, bell pepper and poblanos into small pieces. Add to sautéed corn along with green onions; stir in vinegar and remaining olive oil. Mix well and let stand 20 to 30 minutes to blend flavors; set aside. For bean medley, combine beans, red onion, corn, cilantro, olive oil, lemon juice and vinegar; add salt and pepper to taste. Divide ancient grain pilaf into four bowls. Divide bean mixture on top. Remove skirt steaks from marinade and grill to desired doneness. To serve, slice steak on bias and add one portion to each bowl. Divide avocado corn relish evenly on top. Garnish with additional diced avocado and sunflower seeds.